Last week, the Austin-based Mondo (The Alamo Drafthouse's collectible art boutique) shook up the Internet by announcing a brand new collaboration project between two very well known names - artist Olly Moss and Studio Ghibli. The first poster in this series was based on "My Neighbor Totoro", the beloved 1988 animated film about two young children who encounter a mythical creature. A total of 590 of the posters were made, 420 of the regular version in English and 170 of the variant version in Japanese. Mondo announced them on sale on Twitter last Friday, and within three minutes, they were sold out. It was impressive to see how voracious collectors were to own this piece of art, at $50 for the regular version and $90 for the variant. Twenty-three years after the release of the film that inspired it, "My Neighbor Totoro" has firmly established itself as a part of the iconography of Studio Ghibli. Even in America, the furry grey beast with the pointy ears has become a memorable symbol of all the magic and joy associated with Ghibli productions. Mondo is not the only one to celebrate Ghibli's imagery. In 2010, an artist by the name of Iain Heath created a Ghibli-inspired collection of Lego art for an event called BrickCon. Called Miyazakitopia, the collection of brick sculptures featured characters from films such as "Spirited Away," "Princess Mononoke," "Ponyo," and more. American fans have also expressed their love of Totoro through food, specifically through the art of bento. There are many pictures of these colorful creations on Flickr, such as "Summer Totoro Bento" and even one that shows Totoro in his famous open mouthed scream from the film. In addition to these memorable creations, there are dozens of websites that feature galleries of fan-made art from these films, dedicated Ghibli cosplay groups, and much more. Totoro is the equivalent of Disney's Mickey Mouse. But why does this character resonate so deeply with Japanese and American audiences alike? One thing that fans seem to take away from the wide-eyed character is that it embodies childhood innocence, wonder and delight. It appears to the children in the film during a time of need and gives them hope. 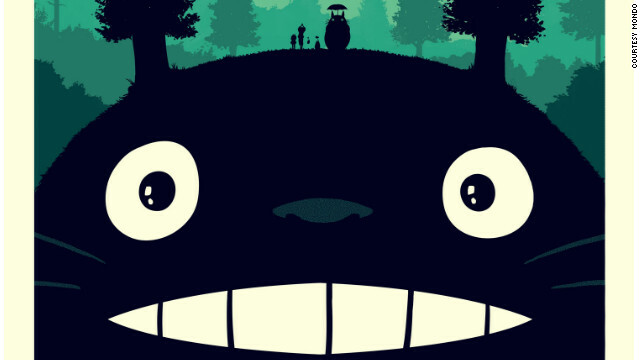 These themes appear throughout Ghibli films, but Totoro seems to remind fans of it most. Seeing a collectible in their homes can often remind fans of those feelings, which is why Totoro is so loved. Of course, it's also very cute, which helps Japanese culture fans who subscribe to the cult of "kawaii." "Totoro is definitely the most popular Studio Ghibli character. It is the only character with an entire book dedicated to merchandise. Totoro's status is such that it's part of the studio's logo," says Lawrence Lin, curator of the American fansite Nausicca.net. "Totoro combines the familiarity of several animals (cat, owl, tanuki) with a helping of Miyazaki's whimsical imagination in a large, friendly, and furry package. That and its ideal proportions as a stuffed animal (squat, stubby appendages, scales well)." It's interesting to note that production of collectibles did not start immediately after "My Neighbor Totoro" was released. "Although Totoro seemed destined for success as a stuffed animal, the studio didn't produce anything until two years after the film's release and then only at the insistence of a toy manufacturer," Lin said. There are shops in Japan solely dedicated to Ghibli merchandise now (there is an excellent one right outside the entrance to Asakusa shrine), and Nausicca.net has compiled an excellent list of online resources where you can purchase collectibles. What tributes to the work of Studio Ghibli have you seen, and in what forms? Have you ever made your own homage to the beloved animation studio's works? certainly like your web site but you have to test the spelling on several of your posts. Several of them are rife with spelling issues and I in finding it very bothersome to tell the truth on the other hand I will surely come back again. Magnificent web site. Plenty of useful info here. I'm sending it to a few friends ans also sharing in delicious. And obviously, thanks in your effort! And you must be a miserable person. Only a miserable person would hate Totoro. Hello, my name is AnnaTheRed. The person who made the "summer Totoro" bento and ALSO the one with Totoro's mouth open. The flickr link for the one with Totoro's mouth open is not correct. The link you have currently is a copy of my photo that someone else posted onto their flickr. I want a giant Totoro I can sleep on. I have nearly all of the Ghibli movies. I've seen them dozens of times and see something new each time I've seen them. I'd rather have the Catbus than Totoro. I loved the Catbus. As a character, Totoro (the big one) combines the appeal of Maurice Sendack's "wild things" with a comforting and authoritative "otherness" found in (oddly enough) Mary Poppins. Id pay $100 to ride Totoro over the forrest. $75 for a catbus ride. You can own artwork from this movie, as well as many other Ghibli productions. Mandarake (www.mandarake.co.jp) sells Ghibli (as well as artwork from many other productions) stuff often, though they can sell for quite high. If given a choice, I'd rather spend my $50 on an original cel or sketch from an anime I enjoy, rather than on a mass produced poster. I couldn't find any original cels on that site for the movie. I wouldn't call these handpulled screenprints "mass produced" with 2 editions equaling less than 600 produced. And I doubt an original stand alone animation cel is as powerful an image for the movie as this poster. The posters are a reproduction of an image, and even if the print run was small, it is a copy. Mandarake does sell a lot of Ghibli artwork, and your best bet is to check out their Big Web Auctions in January, April, July & October. The current BWA did have several Ghibli items, but sadly, nothing from Totoro this time around. Like collectibles from many hobbies, it's something that you have to continually look for. Albert, it sounds to me that you're not very familiar with cel collecting. There are many powerful images from this movie that are available in cel (and sketch) format. There are lots of people that collect artwork from a wide variety anime (Sailor Moon, Dragonball, Inuyasha, etc.) and a lot of this artwork is shown online. Rubberslug is a good site (www.rubberslug.com) that showcases a lot of this artwork. Perhaps, after seeing all the different types of artwork out there, you'll change your tune on whether or not a production cel could ever have the impact that a poster can. I'll keep an eye on that site. I actually own several animation cels from some favorite shows of mine growing up: Ghostbusters, TMNT, Ren & Stimpy among others. They are really neat, but I still can't justify hanging them all on a wall because though they are original creations, they aren't that interesting to look at. It's like owning one panel that was featured in a page somewhere in a comic book. But it would be less significant in meaning since animators have to produce so many slight variations in their drawings for the simplest of character movements. If a clever and talented artist designs an original and limited edition screenprinted poster design that is a beautiful representation of the film, I'll go for it. Have you seen what a well done screenprinted poster looks like? They are stunning. And the artists like Olly Moss (who designed this poster), Martin Ansin, Tyler Stout, Aaron Horkey, etc., who work in the medium are some of the greatest designers we'll ever know in our lifetimes. I agree with you about the fragile nature of original artwork – I'd never hang my cels or sketches up on the wall. I suppose that's why a poster would be better because there would be less guilt involved if the poster was damaged. I scanned my cels and sketches so I could look at them without the need to pull out a celbook to do so. Limited editions are nice and they look as nice as many hankens (images used for posters & other goods) cels and sketches do. Though, with the reliance on CG now, most new hanken artwork solely consists of a finished sketch and a clunky background. Do you have any scans of your cel collection online, Albert? I'd love to see it. $50? Really? Take a look at ebay, these things only go up in value on the secondary market. An Olly Moss Evil Dead print will run you over $1000 and it's only a little over a year old, I know items are only worth what someone will pay for it so maybe in your eyes it isn't worth much but all I'm trying to say is don't be so fast to dismiss it. Wow, I love Ghilbi movies!! I remember seeing My Neighbor Totoro and Kiki's Delivery Service when I was younger – all of his movies are so beautiful and unique! This year for christmas I knitted a 2 foot tall knitted Totoro for my daughter, who is now 15. She has loved that movie since she was small and adores her gift, it went everywhere with her today!